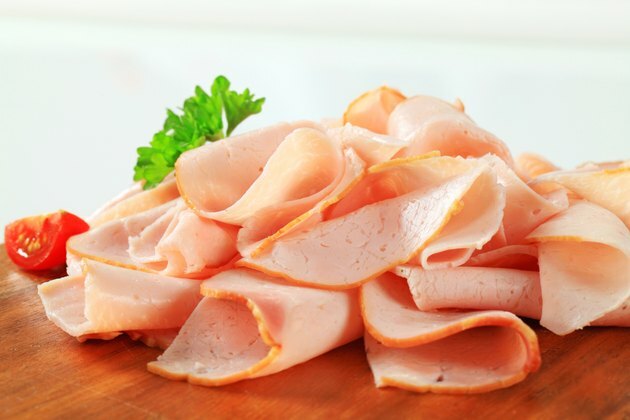 Turkey slices, or cutlets, are boneless, skinless, and offer an alternative to chicken breasts or cooking an entire turkey. The cutlets are sliced from the breast, across the grain of the meat and may be up to 99 percent fat free. They are typically cooked on the stove top and cook in just minutes, making them ideal for weeknight meals. Serve cutlets with a tasty sauce to add moisture, and pair them with steamed vegetables and whole grains for a healthy meal. Rinse and pat dry fresh or thawed turkey slices. Season the cutlets with salt and pepper. Sprinkle on poultry seasoning, lemon pepper or your favorite spices. Heat a skillet over medium heat with 1 1/2 tbsp. of oil or a spray of nonstick cooking spray. Cook the cutlets for three to five minutes per side, or until they are golden brown and no longer pink in the center. Pour 1/3 cup of seasoned bread crumbs onto a shallow plate. Dip the turkey cutlets into the breading, pressing gently to thoroughly coat each cutlet. Heat 2 to 3 tsp. of olive oil over medium-high heat. Add breaded cutlets to the pan and cook them for three to four minutes per side, or until they are golden brown. Serve sauteed cutlets with gravy or a simple white-wine sauce. Pair breaded cutlets with marinara sauce and mozzarella cheese. Avoid overcooking your cutlets to keep them moist and tender.